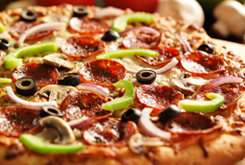 Treat your taste buds to upscale flavor at affordable prices when you visit Milanos Pizza in Idabel, Oklahoma. We serve all your favorite Italian foods: pizza, subs and salads. All of our ingredients are fresh, and our dough is handmade every day. It's never frozen. You can trust that the food we deliver arrives hot and quick. Our cozy, full-table service for lunch or dinner any day of the week provides a comfortable family experience no matter your age. Despite our 15-person seating capacity, we're the perfect location for small group events, such as birthday parties, and school or church functions. Reserve your group event today. Whether you're a meat-eater looking for a bacon chicken ranch pizza or a vegetarian looking for more than cheese on your pizza, Milanos Pizza is here to take care of your cravings. From savory subs and crispy salads to mouthwatering pizza, you'll love every item on our family-friendly menu. Our owner, Faith, bought an existing store in August 2009, and has worked hard to turn the pizzeria around. We're the only pizza place in town that isn't part of a chain, which makes us a local business owned by locals, and serving the needs of the local people.